Stab resistant vests offering protection from blunt forced trauma, edged weapons and hypodermic needles – can effectively help reduce the risk of workplace violence related injuries”, says Robert Kaiser, CEO of UK based PPSS Group. Many internal surveys, conducted by the Ambulance Authorities have concluded that stab resistant vests are not wanted by their frontline staff, but Robert Kaiser strongly believes this is simply due to ‘technical and design misperceptions’ of body armour. He also claims that a twenty-four months long lasting survey, questioning a number of Paramedics within the United Kingdom and North America how they feel about stab resistant vests, concluded a real need for such protective equipment. “Of course, there will be people doubting the efficiency of our survey. Nevertheless, we strongly believe this survey shows once again and very clearly, professionals within emergency medical services require user friendly protection”. 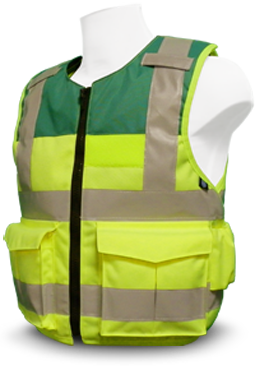 Based on the ongoing survey conducted by UK PPSS Group between Summer 2011 and now, 72.8% of those completing the survey stated “stab resistant vests, which offer blunt trauma protection, should be issued to ALL Paramedics”. 87.7% also confirmed that “paramedics should be issued with their OWN INDIVIDUAL stab resistant vest”. 55.6% mentioned they were not aware of the latest available advances in covert stab vests, e.g. thickness, weight, concealability and wearability. “Many of these professionals still believe stab resistant vests are 6kg heavy, 3cm thick, bulky, uncomfortable, restrictive and confrontational looking. But this is now far away from the truth”. Robert Kaiser is arguing that the vast majority of violent attacks on emergency medical service’ staff are not edged weapon, knife or needle related. He strongly believes that the majority of assaults are ‘blunt trauma related incidents’, meaning these professionals have been punched, kicked or had objective thrown at them. “There is no question about it, the risk of knife or needle attacks exist, but this risk is nowhere near as high as the risk of being pushed, punched or kicked whilst on duty”. “This is why we have developed concealable, ultra thin and extremely light body armour, which that protects the wearer also from blunt forced trauma”. “We fully understand the operational responsibilities and risks of ambulance personnel and our body armour reflect this understanding”. Aiming to clarify the common misperceptions of body armour, Robert Kaiser himself has demonstrated the effectiveness and capabilities of the equipment in several public appearances, which saw impressed audiences gasping for air. Robert Kaiser strongly recommends to all Ambulance Authorities and Emergency medical services which employ frontline professionals to re-look at the potential requirements for user friendly and lightweight stab resistant vests.